With a show-car shape and seductive new details, the CLA’s style is irresistible. Its profile is sleek like a coupe, yet it offers room for five and the innovation that defines a Mercedes-Benz. From its iconic wide grille to its LED taillamps, there may be no car on the road offering such eye-catching style at such an eye-opening price. But more important than its great value are the indisputable values that come with the Star in its grille: innovative safety, thoughtful luxury, and state-of-the-art technology wrapped in artful design. Offer ends July 31st, 2017. © 2017 Mercedes-Benz Canada Inc. 2017 CLA 250 4MATIC with optional Premium Package ($3,800), Premium Plus Package ($1,300) and Sport Package ($2,500) shown above, Total Price $48,354. 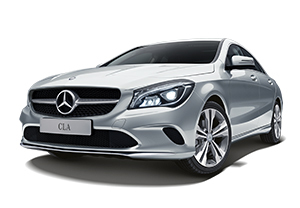 **Lease and finance offers for the 2017 CLA-Class (excluding AMG) available only through Mercedes-Benz Financial Services on approved credit. **Lease offer only available through Mercedes-Benz Financial Services on approved credit for a limited time. Lease APR of 2.9% applies up to 45 months. Finance APR of 0.9% applies up to 60 months. Freight/PDI of $2,395, dealer admin fee of $595, air-conditioning levy of $100, EHF tires, filters, batteries of $25, and PPSA of $45.48 are due at signing. First month’s payment plus security deposit and applicable taxes due at lease inception.First month’s payment plus security deposit of $500 and applicable taxes due at lease inception. MSRP starting at $37,500. Cash Credit of $1,000 is only applicable on the 2017 CLA 250 4MATIC and is a one-time credit for deals closed before July 31, 2017. Vehicle license, insurance, registration, and taxes are extra. Dealer may lease or finance for less. Offers may change without notice and cannot be combined with any other offers. See Mercedes-Benz Surrey for details or call (604) 581-7662. Offers end July 31, 2017.